I'm sitting here eating chocolate stuffed oreos for breakfast. Oh yeah, the breakfast of champions!! I'm on my third post at this session and needed a little pick me up! Do you watch the Olympics? I do. Especially the winter ones. I love all the ones in the winter games. I do watch the summer games, but not every single bit of it. More just the diving and the gymnastics. In the winter games though, man, I'm all over that sh*t. I particularly love the moguls, the freestyle skiing, the snowboarding, ugh just all of it. I TiVo it and then fast forward thru all the BS. I just love it so much! The Russian ice skater dude has been in four Olympics! That's 16 years people! That's a long time to still be competing. This year, he's already gotten his personal best in the short program. I'm behind in my watching so please don't tell me any spoilers!!! In other news, I just got my damn power bill for last month. It's almost double what it normally is! Because it's been so damn cold out, my heat has been on non stop. I keep my thermostat at 66F. Most people I think keep their's much warmer, but I grew up in a cold house and I like it better this way. Plus I'm not paying to keep the house like an oven! 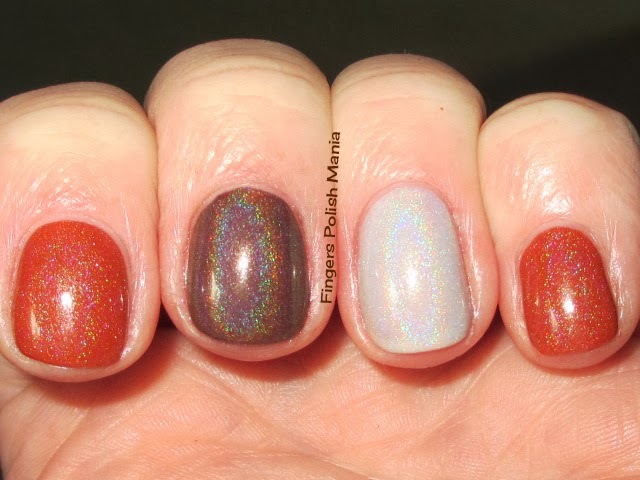 Once again, the sun wasn't out, but I just had to wear a holo. And a very special to me set of holos. Back when Elevation Polish was just starting out, I was one of her swatchers. 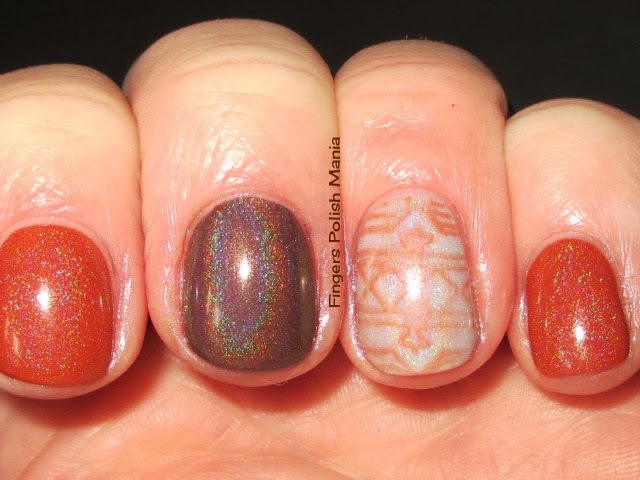 Lulu knew of my love for browns and holos and made me some very special polish. Again these have no names, they were made just for me. 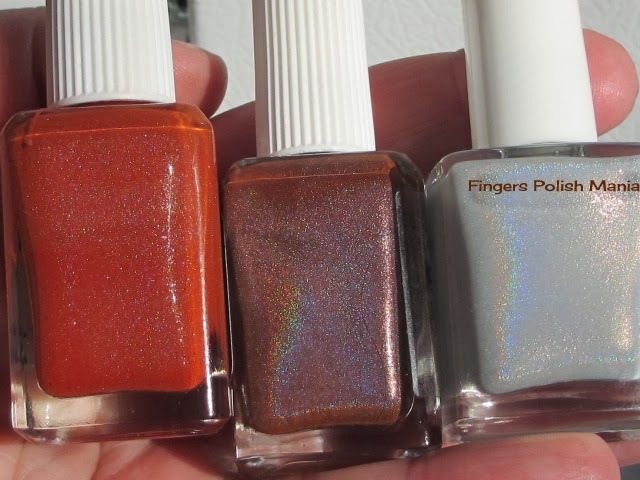 The last one is Liquid Sky Lacquer White Christmas. Oh how gorgeous these are together! 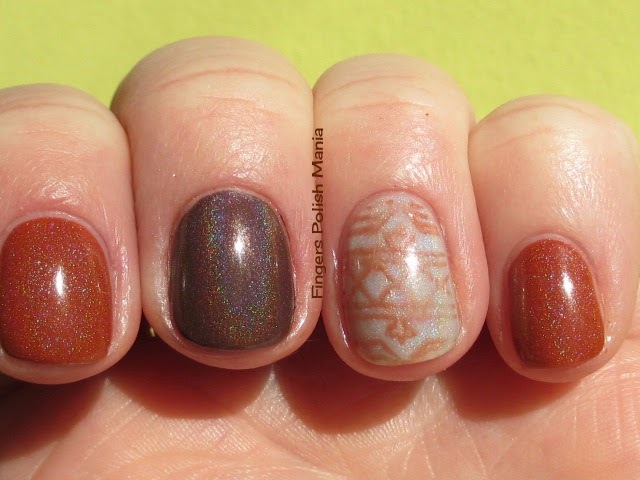 Now remember, this was on top of the gel mani I showed you last post. I know you can't see it, but I see a huge difference in the smoothness of the regular polish on top of gel instead of on top my bare nail. I haven't stopped staring at that aspect of this. 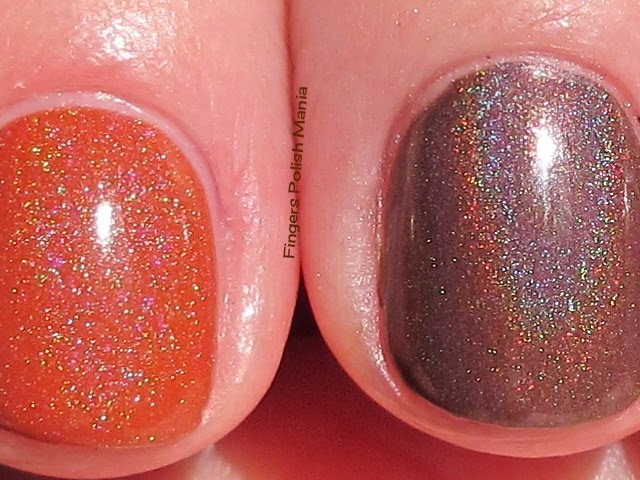 Plus, look how perfect my cuticle lines are and the perfect polishing! Oh yeah. Next because I was now into my third hour dealing with polish, I was tired and lazy. I also really didn't want to cover up these two gorgeous colors. 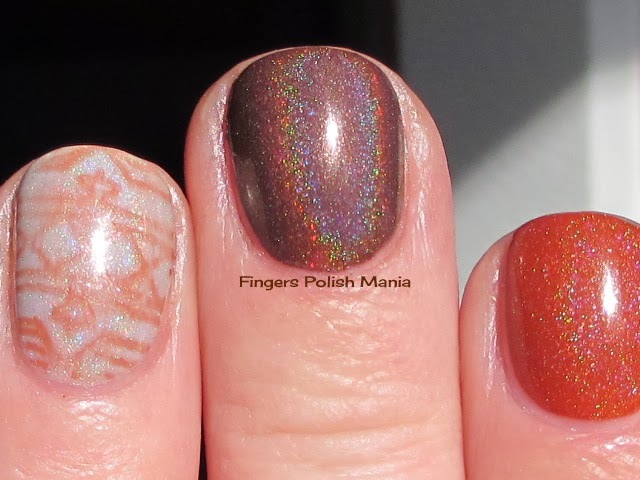 So I simply stamped on the White Christmas using Cici&Sisi plate 1. Here are the results. Oh and the sun came out for this part! 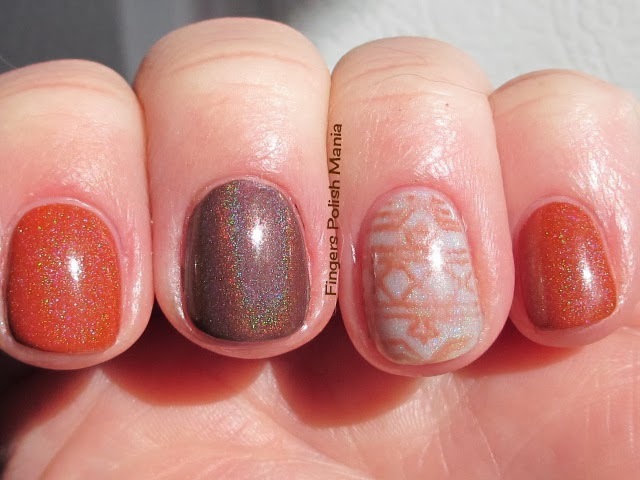 I know I usually show you close ups of my stamping, but these came out not perfect and wonky. The plate was wonky, I was tired and cranky and so on. I do love these colors and am so glad the sun came out to show you how beautiful they are. Next to brown, burnt orange is in the top 5 of my favorite colors of all time. I just think these three together are magical.